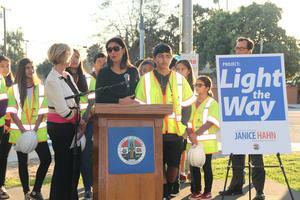 Graves Middle School students joined Supervisor, Janice Hahn, at the opening of a brand new crosswalk at Amelia Mayberry County Park in South Whittier on Wednesday, January 23, after they took an active role in it’s implementation. About 25 Graves’ students wrote letters to Los Angeles County Supervisor Janice Hahn’s office after their fellow classmate, Oliver Maldonado, was hit by a car while crossing the street at the park last April. Oliver sustained serious head injuries and had to learn how to walk again. After the accident Dr. Fraijo, GMS’ principal, asked AVID teacher, Tricia Vega-Jeter, if she could turn this into a civics lesson with her class and do something about requesting a crosswalk to be installed at the intersection. The students researched different forms of crosswalks and features and wrote letters to Ms. Hahn. Three students along with Mrs. Vega-Jeter then attended a council meeting and testified about the need for the crosswalk in order to ensure safety to people in the South Whittier community. 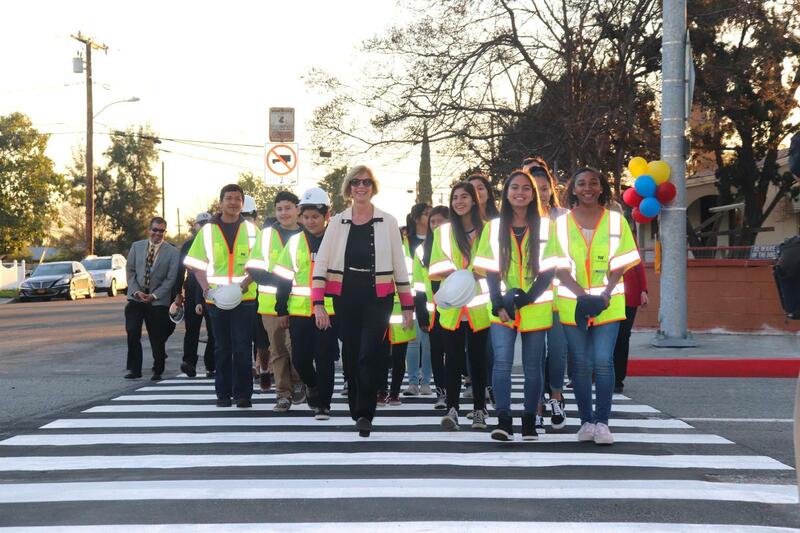 These students then had the opportunity to work with the Department of Public Works’ engineers in their “Junior Engineers” program on the design of the crosswalk project which they named “Project Light the Way”. Eight months and nearly $300,000 later, the crosswalk is complete. The new crosswalk is located on Meyer Rd. and Fidel Ave. at Amelia Mayberry County Park and features LED lights, an audio message that plays in both English and Spanish, and gives pedestrians 35 seconds to cross the street. At the ceremony Janice Hahn spoke about the students and their desire to bring change to their community. Graves’ students also spoke about their experience working in the "Junior Engineers” program and what has impacted them the most about this project. The President of the South Whittier School District school board, Elias Alvarado, also spoke thanking all those involved in this project who have served as examples by making this project a success. Lastly, Oliver’s mother, Claudia Maldonado, spoke thanking students and teachers for their compassion and desire to make the community safer. “Hopefully, this will prevent future families from going through the trauma we had to go through,” she stated. 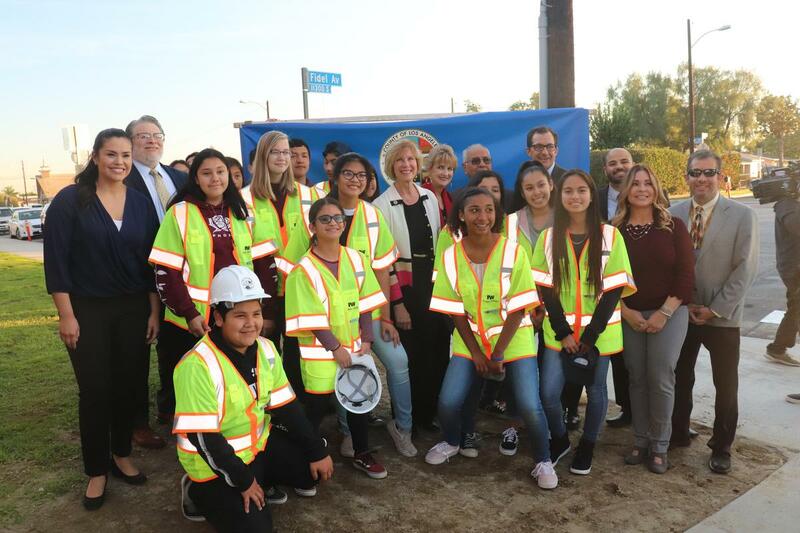 The ceremony concluded with the students along with Janice Hahn flipping the switch of the crosswalk making it a fully functioning and active crosswalk. 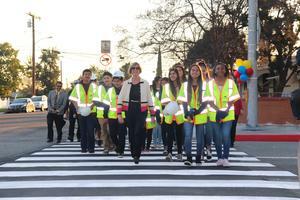 They then got to be the very first pedestrians to walk across for the first time.